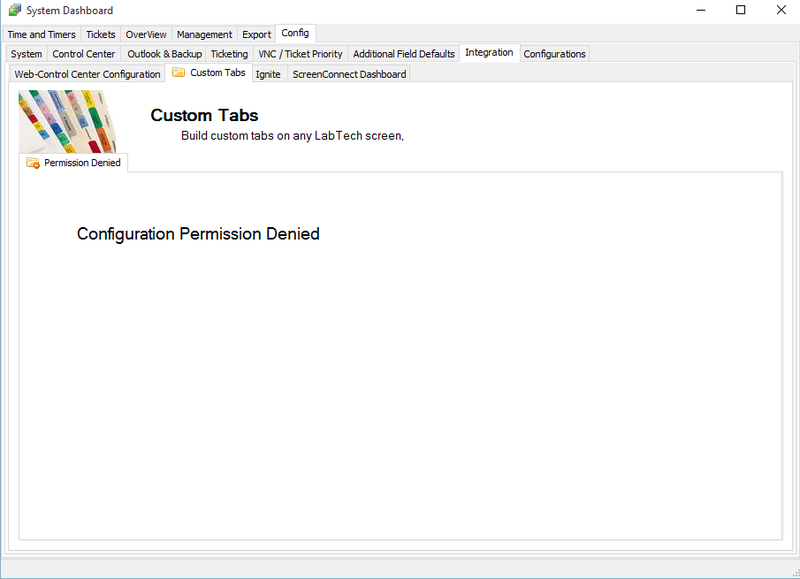 I had setup two custom tabs in the past, went to go add another one the other day and i'm getting configuration permission denied. Any thoughts on this? I tried to uninstall the plugin and reinstall and still same error. - Are you one of these ? Or any user classes that has been chosen before ? - Did you restart the DB agent? and then the LT CC after reinstall the plugin? I am a Super Admin, i did not restart the DB agent and then the LT CC. the plugin update says it will restart the agent so i never took that upon myself. This was a few days ago so i have restarted control center since then. So i figured out the issue. I set the permissions to user class that i was not in, even though i am a super admin. I had to just assign myself the user class i already had set the permissions to on the plugin. Basically, even though my permissions should umbrella over every user classes permission, i still had to add myself to the specific group associated with the plugin and i was able to open it back up.